Fluxhouse Cooperatives - George Maciunas Foundation Inc.
From 1966 to 1975, George Maciunas realized the social objectives of Fluxus towards a pragmatic and non-elitist conception of art in his work as an urban planner in the Fluxhouse Cooperatives. With $20,000 grants from the J. M. Kaplan Fund and the National Foundation for the Arts, Maciunas purchased his first building in 1966 and converted it into lofts which were used as live-work spaces appropriate for artists. By offering shares at about $1 per square foot and charging minimally for renovations, he was able to take in enough deposits to make the $50,000 down payments. With a degree in architecture from Carnegie Mellon and acute knowledge of the city’s building codes, Maciunas also repaired the structural issues of the buildings. Though Kaplan and the Foundation stopped funding Maciunas after the purchases of 80-82 Wooster Street and 16-18 Greene Street, Maciunas continued this system to purchase eleven cooperative units involving seventeen buildings (Simpson). 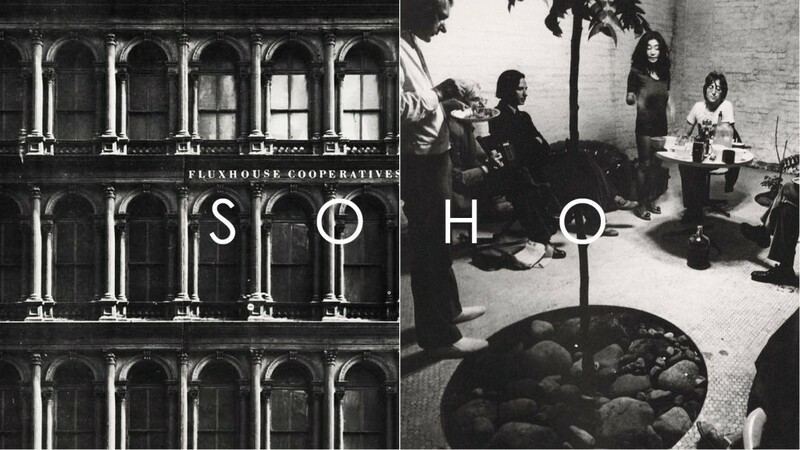 With the Fluxhouse Cooperatives, SoHo may be regarded as Maciunas’s first realization of ‘Fluxcity’, a Kolkhoz or collective estate which offers the space for art to flourish. At the time, Robert Moses’s plan to build the Lower Manhattan Expressway had depressed property values in the area. Known as “Hell’s Hundred Acres”, SoHo was in danger of becoming an industrial slum after manufacturing had declined. Efforts to force the city to buy buildings or forgo the expressway had failed though it was opposed by dozens of public figures and over 200 community groups. Fluxhouse residents were critically aware of their position in occupying illegally obtained and renovated buildings to challenge the M-1 zoning designation which had excluded residential occupancy in areas of light manufacturing. Maciunas himself managed a complex balance of equity for the Fluxhouses without personal remuneration, while eluding city officials with covert antics. After loan sharks posing as prospective buyers broke his ribs and blinded his left eye, Maciunas was compelled to withdraw from his managerial services in 1975. Though the project was met with obstacles, the loft artists’ power effectively stopped construction of the freeway: “Opposition to the expressway was going nowhere. Our whole planning board couldn’t even slow it down. Then a handful of artists stepped in and stopped it cold” (South Houston Artist Tenants Association). By the 1980s SoHo had become a thriving area for contemporary art, famous for its galleries and attracting artists. In 1992, the New York Times recognized Maciunas’s contribution and coined his famous nickname as the ‘Father of SoHo’. Maciunas’ initiative also extended into neighboring areas; notably, the Lower East Side underwent a similar renaissance in the 70s and 80s. The ‘SoHo Effect’, quintessentially used to describe instances when artists move into underdeveloped neighborhoods and beautify spaces thus raising the quality and value of the area, has continued to resound in urban environments across New York City and the world. While gentrification is a term fraught with the politics of race and class displacement, the narrative of artists as agents of social change cannot simply be described as ‘colonization’. His ‘cooperative model’ has become a case study for combating the issue of gentrification when affluent developers move in to capitalize on newly improved areas. In realizing a vision of architecture based on collective ownership, the Fluxhouse Cooperatives may arguably be Maciunas’s most influential and widely practiced Fluxus project. Charles R. Simpson, “The Achievement of Territorial Community” in SoHo: The Artist in the City (Chicago: The University of Chicago Press, 1981) pp. 153-188. Gray, Christopher. “Streetscapes: 80 Wooster Street; The Irascible ‘Father’ of SoHo.” The New York Times [New York, NY] 15 Mar 1992, n. pag. Web. 13 Jan. 2014. Hybenova, Katerina. “Mobilization of Bushwick Against Gentrification Began. Will We Be Able to Stay?.”Bushwick Daily. 20 Jun 2013: n. page. Web. 13 Jan. 2014. <http://bushwickdaily.com/2013/06/mobilization-of-bushwick-against-gentrification-began-will-we-be-able-to-stay/>. Melton, Hollis. “Notes on SoHo and a Reminiscence.” Trans. Array The Avant-Garde: From Futurism to Fluxus. New York, NY: Jonas Mekas Visual Arts Center, Print. Nicodemus, Anne Gadwa. “Artists and Gentrification: Sticky Myths, Slippery Realities.” Createquity. Ian David Moss, 05 Apr 2013. Web. 13 Jan. 2014. <http://createquity.com/2013/04/artists-and-gentrification-sticky-myths-slippery-realities.html>. DADA TO DIY: The Rise of Alternative Cultures in the Twentieth Century By John Held Jr.
An Anthology: The Education of Mr. Fluxus by John Held Jr.
I’ve Ripened to the Genius of George Maciunas By John Held, Jr.